A new investment designed to increase access to solar energy for thousands of households in West Africa has been announced by CDC, the UK’s development finance institution. CDC is committing the equivalent of US$12.5 million to PEG Africa (“PEG”), the leading distributor of solar home systems (“SHS”) in the region. CDC’s investment sees it provide vital local currency debt to PEG, which operates in Ghana, Cote d’Ivoire and Senegal. PEG has provided over 60,000 predominantly rural, low-income households (300,00 beneficiaries) with a clean and reliable source of energy and will use CDC’s capital to reach a further 200,000 households over the next four years. This investment in PEG is CDC’s first to qualify for the 2X Challenge. 2X is a major commitment announced last summer by the development finance institutions of the G7 to mobilize US$3 billion by 2020 for investment in businesses that benefit women, as entrepreneurs, as business leaders, as employees and as consumers of products and services that enhance their economic participation. PEG reaches some of the poorest and most vulnerable customers in West Africa, where more than 150 million people live with no access to electricity and spend up to 30 per cent of their incomes on poor quality, polluting and sometimes dangerous fuels like kerosene, candles and batteries. PEG provides credit for SHS, via its pay-as-you-go financing model through 70 service centres employing over 400 full-time staff. More than half of PEG’s customers earn less than US$3 a day, while 89 per cent do not have access to the national electricity grid. 82 per cent had never received financing or access to credit before becoming PEG customers. PEG also provides hospitalisation and life insurance to good customers (over 25,000 to date), a unique offering within the solar homes systems industry. PEG qualifies as a 2X Challenge investment because it meets at least one of the criteria of the 2X eligibility framework. The company has introduced a mentoring programme for mid-level female managers and has set specific targets to help increase the number of women in decision making positions. PEG has also introduced gender sensitive recruitment strategies, flexible working hours and is encouraging the take up of paternity leave. 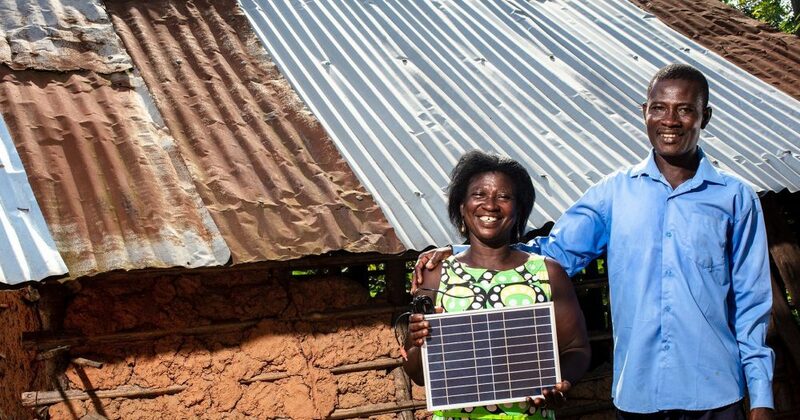 CDC will showcase the active steps PEG has made to advance women across their business on the 2X challenge website, in order to demonstrate best practice to others in the off-grid solar sector and beyond. CDC is playing an important role in supporting the off-grid solar (“OGS”) industry in Africa and the PEG investment is CDC’s second from its OGS debt initiative, which is designed to address the shortage of local currency funding for SHS companies. CDC is working directly with companies like PEG, as well as through local banks and specialist debt funds, to deploy up to the equivalent of $150 million in the sector. CDC’s investment is the first local currency debt provided to an OGS company in West Africa and marks an important step towards reducing the sector’s exposure to currency fluctuations and increasing its long term financial sustainability. CDC is providing both Ghanaian Cedi and West African CFA Francs. OGS covers a broad range of products and services from small solar lanterns to mini-grids and commercial and industrial applications. It is a relatively nascent sector in Africa, so new business models and financing are being explored but access to local currency debt has consistently been in short supply for companies. In late 2017 CDC made its first investment through its OGS strategy, backing M-KOPA in East Africa with US$21 million debt in Kenyan and Ugandan currency. CDC’s has arranged the local currency debt funding, bringing in a further US$2.5 million from SunFunder, a solar energy finance business. The local currency debt is part of a larger US$25 million capital raise by PEG, including US$5 million of equity from existing shareholders and US$5m of subordinated debt provided by ElectriFi.